And when they logged in to a fresh desktop they couldn’t print and when we checked their printer it said it needed drivers. What I found was that this only happened with drivers of the non packaged type. Microsoft has been pushing to use packaged drivers ever since Windows Vista came out but apparently some manufacturers stil use older style not supported drivers. This is easily checked when you go into Print management and have included the column packaged. 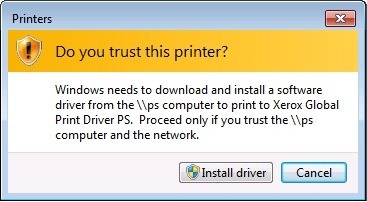 Computer Configuration>Policies> Administrative Templates>Printers>Point and Print Restrictions from Not Configured to Disabled or enabled with some settings. With this KB installed and probably also with he other kb’s for other OS mentioned in the accompanying security bulletin: https://technet.microsoft.com/library/security/MS16-087 Windows ignores this setting and gives the warning anyway. For most systems clicking the allow once won’t be a big issue but when you have floating desktops where the printers get added every logon this is an issue so please be aware of this! Tagged floating desktop, horizon, kb, microsoft.